Patients and visitors to The Royal Dental Hospital of Melbourne are asked to carefully read the following instructions in case of an emergency. Do not panic and remain calm. Listen carefully to announcements and alarm tones. If you require assistance you should tell a warden (any person wearing yellow or red hard hats). Do not use the lifts. Only exit the building when told to do so by one of the wardens. Once evacuated, do not re-enter the building until you are told it is all clear. Should an emergency occur, an announcement will be made and repeated via the overhead speakers, stating the type of emergency. Two different fire alarm tones, increasing in volume, will be heard in conjunction with announcements via overhead speakers. (30 second duration) followed by an announcement to evacuate the building. 1. North - West corner, Swanston & Grattan Sts. 2. 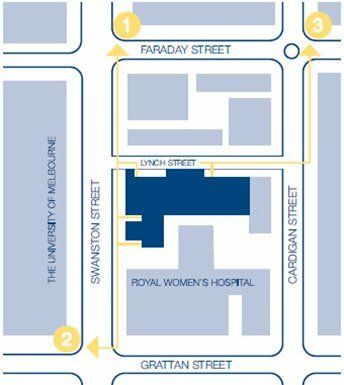 North - East corner, Swanston & Faraday Sts. 3. South - West corner, Faraday & Cardigan Sts. Drawings of assembly areas and exit / escape paths are located on each floor. Got a question? Email: fmfaults@dhsv.org.au or call 9341 1349.